MAZDASPEED3 Review: Mazda wants you to think of them as a sports car vendor. Picture the little two-seat Miata, the most popular sports car ever made. More than half a million have been sold over the last 20 years, and that sounds like an old McDonalds sign. Or consider the legendary RX-7 with its rotary engine. And how about the unique four-seat RX-8? Granted, these are not big sellers on a yearly basis, but it all adds up. The MAZDASPEED3 though, is more of a 21st-century GTO, lots of power in a compact body. The restyled 2010 model employs the same method for power as the previous generation car, turbocharging and intercooling, to pull 263 horsepower and 280 lb.-ft. of torque out of just 2.3 liters of displacement to move a 3,245-pound car. The ordinary Mazda3 five-door, no slouch, makes do with “only” 167 horsepower and 168 lb.-ft., to move 250 fewer pounds. When you step on the gas, the car jumps forward with minimal turbo lag. And with this car, you can see the boost on a handy LED gauge mounted directly in front of you. Most turbocharged cars dispense with that today, but it’s fun to see it move. Among the numerous advances in the new 2010 model is revised gear ratios, spaced further apart to make better use of the engine’s prodigious torque. I didn’t compare the old car with this one side by side, but you definitely know you’re not driving any ordinary vehicle. The Mazda3 is a volume seller for the brand, so the 148-horsepower four-door sedan is offered for the budget minded. The five-door, as a mini-wagon, is much more useful, with seats that drop and a hatchback door that pops up to swallow what you’ve got to move. My big upright bass fit right in, as did loads of groceries. Despite its practical nature, the new MAZDASPEED3 looks ferocious, from its grinning face to its rear-mounted basket-handle wing. It gets a load of special features to distinguish it from its pedestrian siblings. The nose flaunts an air dam and round fog lamps with a sinister black grille. You have to watch those curbs and cement parking stops, though. The hood wears a working air scoop for the intercooler. The front fenders bulge to accommodate wider high-performance wheels and tires. Sculpted side skirts and a lowered stance show off those wheels, which are modeled on the forged 19-inchers from the RX-8 and feature five “Vs” that culminate in 10 shiny spokes at the rim. In back, a black valance panel mimics the grille. Inside, black is also the dominant theme, an industry wide convention for “sporty.” Red accents abound, in the seat and door fabrics and in the stitching that graces the steering wheel, shift lever boot, seats, door trim and center armrest. Metal pedals and MAZDASPEED logos clue you in to the car’s identity. And man, those seats really grip you with deep bolsters. You don’t want to be sliding around when you go out to play. Unless you really lead foot it, you can expect decent fuel economy. I got 24.0 mpg, while the EPA offers up 18 City, 25 Highway, on premium fuel. The EPA Green Vehicle Guide rates the car as a 7 for Air Pollution and a 5 for Greenhouse Gas, a little better than average. Lots of small but significant changes make the 2010 model an all-around better and more fun-to-drive car. The engineers, feeling that power was sufficient, increased structural rigidity, using thicker and higher-strength steel in crucial areas. The extra stiffness let them install a firmer suspension without sacrificing ride comfort. They improved steering feel by adding additional support for the steering rack and changing from a hydraulic steering pump to an electric motor. The MAZDASPEED3 comes with the stuff that enthusiast drivers want, but the product developers tried to keep the weight down by avoiding some items, such as a moonroof. If you really want to upgrade the car, the Tech Package delivers a 242-watt, 10-speaker surround sound system, a navigation system, pushbutton start and keyless entry. My Velocity Red Mica test car had this $1,895 package. The navigation system controls are on the steering wheel, so only the driver can set them, not the passenger, but you’re supposed to do that while parked anyway. The color screen in the upper dash is useful, but the smallest I’ve ever seen. The list price for the MAZDASPEED3 is $23,195. Adding the tech package and delivery charges, mine came to $25,840. That’s comparable, even favorable, compared to competitors like the Subaru WRX and Mitsubishi Evolution. Mazdas offer performance, high quality and reliability, decent economy and plenty of style, so with this MAZDASPEED3, what’s not to like? 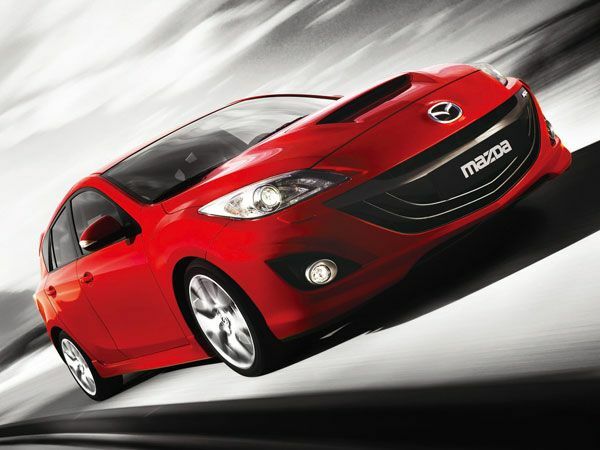 The Bottom Line: The 2010 MAZDASPEED3 is a proven performance and fun driving package for the price. For around $25,000 you can have a sporty sedan that tracks like its on rails. Plus the turbocharger, spoke alloys wheels and 263 horsepower add up to a great buy all around. And the clean bodylines sporting a front air dam, functional hood scoop and a tall rear spoiler let everyone know from a distance that this car is special.